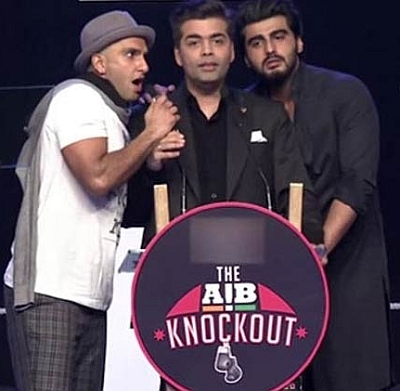 The Pune police have registered an FIR against the participants of the controversial 'AIB Roast' show, which featured Bollywood director Karan Johar and actors Ranveer Singh and Arjun Kapoor. The complainant in the case is a police inspector with Pune CID, Vazir Hussain Sheikh. Sheikh told PTI that he filed the first information report in his personal capacity, finding the show to be "inimical to the Indian culture". The video of the show went viral on YouTube. It was, however, later taken down from YouTube after protests erupted over the use of expletives and sexually explicit jokes and the Maharashtra government ordered a probe. of the Information Technology Act, a police officer said. The FIR names Karan Johar, Ranveer Singh, Arjun Kapoor, Deepika Padukone (she was part of audience) and comedians Abish Mathew, Tanmay Bhat, Aditi Mittal, Simran Khamba, Ashish Shakya, Raghu Ram, Rohan Joshi, and film critic Rajeev Masand, and others, the officer added. The AIB roast event, staged in Mumbai in December, was attended by 4,000 people and the audience included Johar's mother, Sonakshi Sinha, Alia Bhatt, Deepika Padukone and Anurag Kashyap among others.